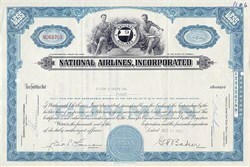 Beautifully engraved certificate from National Airlines issued in the 1960's. 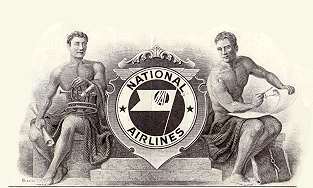 This historic document was printed by the American Banknote Company and has an ornate border around it with a vignette of a vignette of two allegorical men sitting on both sides of the National Airlines Logo. This item has the printed signatures of the Company�s President and Secretary. This airline was known for its quality of employees and service to its passengers. Certificate Vignette National Airlines began in St. Petersburg, Florida, in 1934 with the award of a 142-mile mail route between St. Petersburg and Daytona Beach, via Tampa, Lakeland and Orlando. Service over the route was inaugurated on October 15, 1934. The fleet consisted of two second-hand Ryan aircraft. The airline had five employees, including the president and founder, G. T. Baker. On July 8, 1937, the company was charted under the laws of the State of Florida as National Airlines, Inc. Routes were extended to Jacksonville and to Miami in that year and from Jacksonville to New Orleans in 1938. The company relocated it's general offices and principal base of operations in Jacksonville in 1939. During World War II the carrier operated a portion of its fleet for the Air Transport Command and operated Air Corps contract schools for pilots, mechanics, radio operators and navigators. In 1944 National became a major airline with the award of the New York-Florida route. On February 14, 1946, National inaugurated with DC-4s the first non-stop service between Miami and New York and the first four-engine commercial flights between the two cities. National was certified into Havana, Cuba, in 1946 and was awarded a new route from Miami and Tampa to New Orleans in the same year. in mid-June 1946, National moved it's General Office to Miami and four years later moved it's engine overhaul base to Miami from Jacksonville. Havana service was suspended indefinitely in 1961, after the United States and Cuba broke off diplomatic relations. In 1947 National received permission to inaugurate the so-called "Great Circle" route over water between Miami and New York, and reduced the flying time from five to four hours. National pioneered in 1950 on the East Coast with low night coach and excursion fares to Florida, and with a Florida summer vacation program that contributed to creating a year-round operation for the state's tourist industry. On January 1, 1952, National became free of subsidy and was placed on a mail service rate that made it self-sufficient over it's entire system. In 1956 the National system was extended to Houston and to Boston. National leased Boeing 707 jets to become the first domestic operator of jets in the United States and inaugurated jet service between New York and Miami on December 10, 1958. On March 11,1961,National's system was expanded with the award of the Southern Transcontinental Route. The route extended the carrier from Houston to Los Angeles/ Long Beach and to San Diego, and from Houston to San Francisco/Oakland/San Jose via Las Vegas. L. B. Maytag, who resigned as president of Frontier Airlines in March 1962, purchased controlling interest in National on April 26, 1962. Mr. Maytag was elected president and chief executive officer on that date. Dudley Swim, of Carmel, California, was elected chairman on September 12, 1962. National in 1964 became the first exclusively jet-powered U. S. airline. In 1967 and 1968 the airline doubled it's jet fleet and phased out all prop-jet aircraft. On April 21, 1968, the last of the prop-jet electras was retired and National became all pure-jet with a fleet of DC-8s and B-727s. Miami's first Boeing 747 service was inaugurated by National on October 2, 1970, with daily nonstop flights between Miami and New York. The second of the 352-passenger B-747s went into nonstop operation between Miami and Los Angeles on October 25, 1970. the 747s were sold in 1976. After exhaustive study of second-generation wide-cabin jets, National selected McDonnell Douglas DC-10s as the finest, most economical and most adaptable to its route system. in 1969 the company ordered nine DC-10s, and in 1971 ordered two intercontinental versions of the DC-10. Four additional DC-10s were ordered in January 1973. The first DC-10 service between New York and Miami, Palm Beach and Tampa was introduced by National on December 15, 1971. Service expanded as additional new jets joined the fleet. The "good neighbor" DC-10 demonstrated that it has unusual customer appeal. This wide-cabin jet is comfortable, reliable, quiet and smoke-free. Ground was broken in 1968 for a $45 million expansion program by the Dade County Port Authority for National Airlines at Miami International Airport. The project was completed in 1974. A $17 million IBM electronic computer reservation system, called Res-A Vision, was completed and put into operation in 1970. The communications network enables National reservations agents throughout the carrier's system to exchange information immediately with two computers in the Miami headquarters. The system allows passengers to make reservations with a minimum of delay and error. National became the third U. S. transatlantic passenger carrier on June 16, 1970, with the inauguration of daily nonstop round-trip service between Miami and London. This transatlantic route has proved appealing to passengers who wish to avoid the congested gateways and inclement weather of northern airports. Service with the intercontinental DC-10-30s was inaugurated on the route in the fall of 1973. Dudley Swim, Chairman of the board, died in Carmel, California, on January 31, 1972. Mr. Maytag was elected chairman on February 11, 1972. E. F. Dolansky, formerly executive vice president, was appointed president and chief operating officer on December 7, 1976. Mr. Maytag retains the title of chairman and chief executive officer. National's European horizons were further expanded June 22, 1977, when the airline inaugurated Miami-Paris nonstop service with DC-10-30 aircraft. National provides the only U. U. flag airline service to Paris from the South. In May 1978 the airline introduced nonstop flights between Florida and Frankfurt and Amsterdam. New York- Amsterdam service was inaugurated in December 1978. National also extended its route system in 1979 by adding service between Miami and San Juan, and to Seattle from Houston and Los Angeles. National's success was its downfall, as all of its aircraft and equipment was paid for. A bidding war began over the takeover of National's system. In 1980 Pan American World Airways acquired National Airlines and operated its routes poorly. De-regulation was passed and suddenly Pan American was debt ridden. This was the beginning of an eleven year downslide.